This villa with capacity for 7 people has 3 bedrooms, two bathrooms, living room with TV, DVD, gallery with living room and a large modern kitchen. The kitchen is fully equipped with all amenities, hob, dishwasher, fridge freezer, microwave, toaster, grill, etc .., plus kitchenware. Central heating. The house enjoys a spacious veranda furnished with teak table and chairs to enjoy outdoor meals, a large pool and sunbeds to relax and enjoy an unforgettable vacation. It is ideal for families with children due to its large garden is ideal to enjoy large and small, also have different outdoor games for both the pool and to the garden. 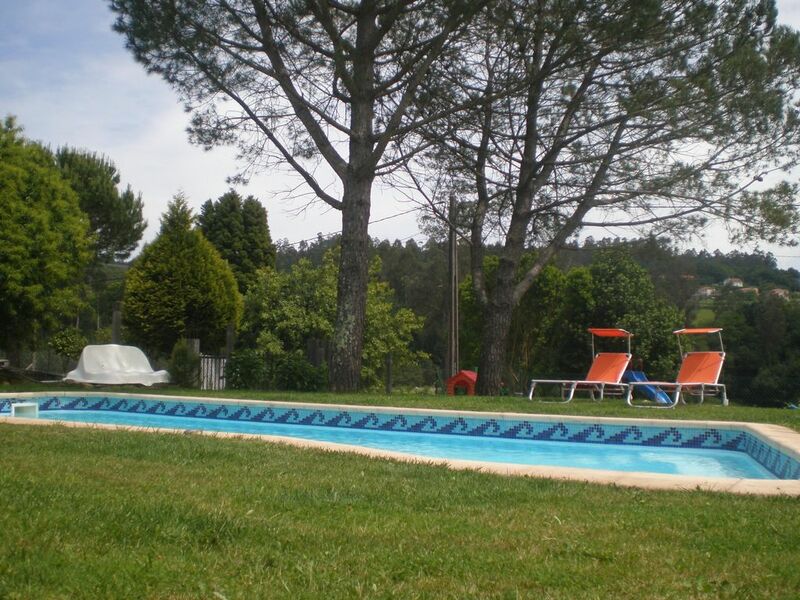 Its beautiful setting, located in the heart of the valley of Ulla invites long walks and of course all this just five minutes drive from the center of Santiago de Compostela. Galicia is a pleasure for the senses. Its beautiful beaches, rural landscapes and sea, a comfortable temperature and excellent cuisine, make it the perfect destination. Besides the above mentioned Santiago de Compostela, we can enjoy the Altas and Bajas, the coast of Finisterre, Ortigueira, Ribadeo and Foz. In cities like Vigo or precious villas as Baiona and A Guarda, all on the edge of the sea. This house is located 6 km from Santiago de Compostela, in the heart of the valley of Ulla (Vedra, a beautiful landscape dotted with history, culture and tradition where one of the pilgrimage routes leading to Santiago is located, known as Camino Real or Vía de la Plata. In this magnificent setting you can enjoy the scenery as doing different walking route do Pereiro, A or A route Muiño do do viño route. Santiago de Compostela declared a UNESCO World Heritage Site stands out for its cathedral with the four squares surrounding it, Obradoiro, Quintana, Platerias and Immaculate. They are a must see its historic streets and monuments and museums. Santiago also offers other possibilities such as art galleries, original architecture and its parks and gardens. At sunset, stroll through the illuminated city, dinner, talking in front of a drink, or go wine and tapas is one of the most enjoyed activities in Compostela.